SHROVE TUESDAY is a time for religious celebration and, more specifically, feasting on a glut of delicious pancakes ahead of the Lenten Fast to come. It’s a chance for Irish families the world over to get together around the dinner table for a night of sweet and savoury treats in the name of the Holy Father. But even if you can’t be with your nearest and dearest this Shrove Tuesday, there are still plenty of ways to ensure you get a taste of Ireland on your plate. 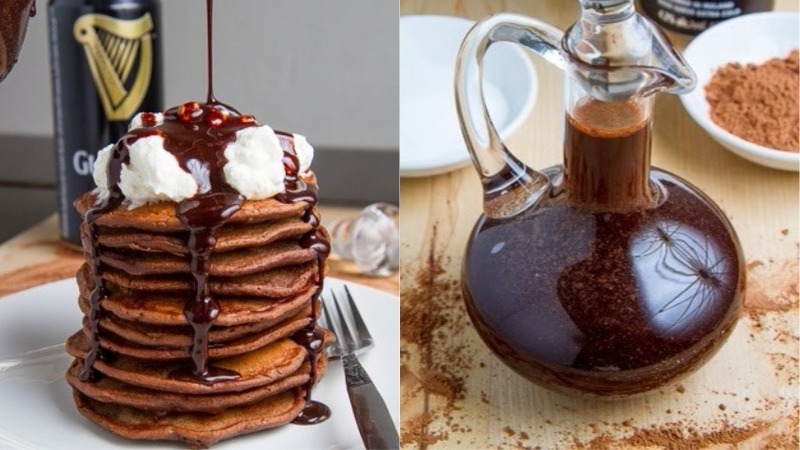 This Bacon Guinness Chocolate Pancakes recipe isn’t a traditional Irish favourite – it actually comes from the US website Closet Cooking – but it’s full of flavours that will stir memories of the Emerald Isle. Plus, it comes complete with a Guinness chocolate syrup. What more could you want? Let’s dig in. Mix the flour, cocoa powder, baking powder and salt together in a large bowl. Mix the Guinness, egg and butter in a separate large bowl. Mix the contents of both bowls together and add in the bacon bits. Melt a touch of butter over a heated pan. Pour 1/4 cup of the mixture into a pan and cook until the surface starts to bubble and the bottom is golden brown. Flip the pancake and cook the other side until the bottom is golden brown. Serve in a stack topped with a head of frothy whipped cream and Guinness chocolate syrup. Mix all of the ingredients together in a pan. Bring everything to a boil, reduce the heat and simmer to thicken. Heat for about 5 minutes.